Police battling the threat of terrorism have unveiled a new tactic - they are targeting internet cafes. As evidence suggests that several people convicted with terrorism acts have visited internet cafes while plotting their crimes, the Metropolitan Police are trialling a new initiative in which owners agree to monitor what customers are looking at, and report any suspect activity to police. The visit by two policeman and a community support officer is unannounced - but this is not a raid. Instead they are here at an internet cafe in Camden in London as part of a new programme in the government's £140m Prevent strategy to help counterterrorism. The new initiative involves getting internet cafe owners to monitor the websites their customers view and to pass on any worries over suspicious activity to the police. 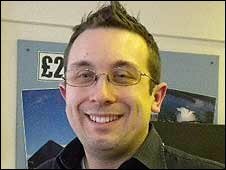 Steven Staples owns one of the internet cafes in Camden that the Prevent officers visit and he is given posters to put up warning the public of material which is deemed unacceptable to view. He is also given the choice of which coloured background he would like for a Metropolitan Police screensaver to upload on to his machines to spell out the same message. The scheme is on trial in Camden. If it is successful, the Met Police hopes other police forces, as well as universities, will adopt it to help target a tool of research and communication which used previously by terrorists. In August 2006, police made a number of arrests as part of Operation Overt and, three years later, three men were found guilty of planning to use liquid bombs to blow up a possible seven planes. Abdulla Ahmed Ali was jailed for 40 years, while Assad Sarwar was sentenced to 36 years and Tanvir Hussain to 32 years for masterminding the plot. The key suspects in the case had been found to have used internet cafes for research and to send e-mails to other conspirators. 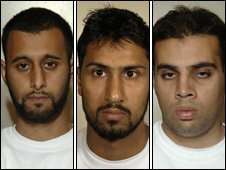 In Operation Rhyme, a plot to explode car bombs at financial targets in New York and London was foiled and seven men were jailed in June 2007. Two of the conspirators, Junade Feroze and Abdul Aziz Jalil, were followed by officers as they drove four hours from London to an internet cafe in Swansea where they sent one e-mail before returning. The Prevent strategy, also known as Preventing Violent Extremism (PVE), aims to stop people becoming or supporting terrorists. Police say that the internet cafe programme is not about arresting people, but more to determine if their users need what they term as "support". Mr Staples and other internet cafe owners BBC Asian Network have spoken to say they have not yet had any cause to worry about the content their customers view. But Mr Staples agrees with the measures the police are implementing: "I would tell whoever I needed to if I was concerned with what people were doing [in my internet cafe]. "It is good to have some framework to point to [in terms of the poster and screensaver] and tell people that what they're doing is not on." The police want internet cafe owners to check the hard drives of their computers to help spot any suspicious activity. Pc Jason Beynsberger is a Prevent engagement officer for Camden and he tells Mr Staples to contact him if he notices anyone accessing extremist material. "Obviously every situation is different," said Pc Beynsberger. "We need to establish if there is something we need to investigate further, for example, if there's a pattern forming. "If the owner sees people looking at violent extremism they need to know who they can turn to." Using internet cafes may help those guilty of suspicious behaviour avoid being detected by police, but there are concerns that PVE amounts to police playing Big Brother. Arun Kundnani is the author of Spooked: How Not to Prevent Violent Extremism, which is published by the Institute of Race Relations. "To ask internet cafes to spy on their customers and students is another step in the direction of creating a society of total surveillance," said Mr Kundnani. "What is dangerous about this initiative is that it does not just focus on preventing access to illegal material but also material that is defined as 'extremist' without offering an objective definition of what that is. "It thus potentially criminalises people for accessing material that is legal but which expresses religious and political opinions that police officers find unacceptable. "It is likely to result in not only a general violation of privacy and freedom of expression but also discrimination against Muslims, whose use of the internet will be seen as inherently more suspicious." You can hear more on this story on the BBC's Asian Network Reports radio show or via the BBC iPlayer.